Hi everyone! 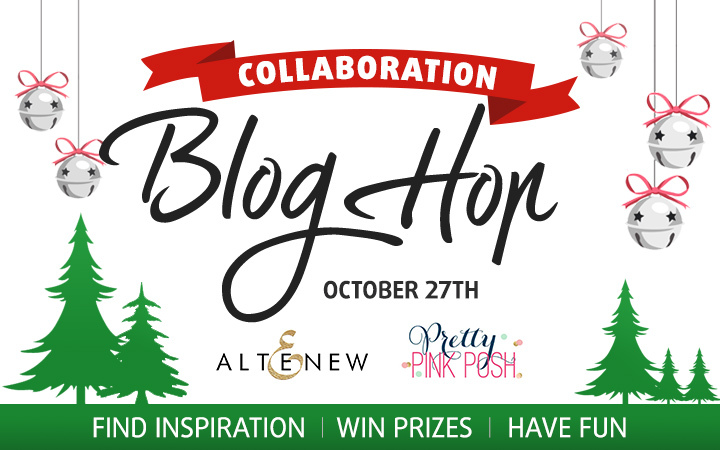 Welcome to Altenew and Pretty Pink Posh collaboration blog hop. Two design teams gathered together to bring some inspiration and ideas using supplies from both companies. You probably came from Keeway Tsao. If not, you may consider starting from the hop beginning, over at Altenew blog. I made two holiday cards for today special event. Pretty Pink Posh Twine and Bows is a great die set to “wrap” a card (panel or some other element) with twine without adding bulk of actual twine. But I also saw in this twine die some kind of garland or Christmas lights, hung in mid-air. Or light rays coming from lights on a Christmas tree. So I wanted to use this die to represent this image. The background was made by inking a white panel made out of Altenew Classic Crest White cardstock with distress inks. First I inked the whole panel using Tumbled Glass ink. Then I cut out Twine die three times out of masking paper and placed them onto the panel. Which was then inked with Broken China and Mermaid Lagoon. To make background a bit more interesting and deep, I added several water droplets using Distress Sprayer, let the water sit on the panel a bit and move distresses and them removed it with paper towel. Also two die-cuts were made out of silver glitter paper using the same die and adhered to the panel. I made a tree using Altenew Sketchy Evergreen stamps set, stamping the bottom solid layer onto a white cardstock using Dessert Night ink, the heat embossing the middle layer on vellum using Silver Tinsel powder. Then I cut out both layers and adhered them together. Usually adhering velum can be a challenge, as any adhesive can be seen through it. Here I didn’t care much about this, I rather wanted adhesive to be seen. I like that it unevenly is visible, it looks like shadows between tree branches. The sentiment was stamped using Dessert Night ink and heat embossed using iridescent powder to add it some shine. The tree was foam mounted on the panel, which in turn was mounted to a card base. Several cobalt and silver sequins finished off the card. Last year during holidays I saw a floral composition in front of one building next to our office. It had glittery branches with gold pinecones. I was inspired to create a card with these elements, and finally did it. I started by cutting out a white panel using dies from Pretty Pink Posh Stitched Borders 2 die set. Stamped pinecones from Altenew Poinsettia and Pine, colored then with COPICs and heat embossed using brass powder. Next pinecones were masked off and I stamped several branches from Altenew Winter Cardinal using Espresso ink. I added berries from the same set using Rocky Shore ink. Using Versamarker I added embossing ink on berries, branches and cones, covered them with Gold Tinsel powder and heat set them. The panel was foam mounted on a Peanut Fudge card base, with brass embossed sentiment from Modern Deer on the bottom. Several cupped and flat gold sequins finished off the card. There are TWO $100 prize packs from Altenew and Pretty Pink Posh up for grabs. Two winners will be picked randomly from the comments left on any of the blogs listed below. Please leave your comments by Wednesday, November 2, 2016, at midnight EST to be eligible to win. Winners will be announced on the Altenew and Pretty Pink Posh blogs on Thursday, November 3rd. The next stop in the blog hop will be Amy Kolling. If you got lost, please go back to Altenew Blog. Like these projects? I created a Pinterest-friendly pictures that give several views of the cards. You can pin them and save for later. Contrasting but same these cards is an incredible work. Love the silver Christmas tree and the golden pine cones. Really great cards – so different. Hope you’re loving NYC! I am so excited about this release. It’s so hard to choose a favorite. Your cards are gorgeous! Beautiful cards! Love the details. Thanks for sharing on this fun blog hop!! Your tree in the blue tones is so festive! I am in love with those gold pinecones. They are a must have! Thank you for sharing! Great cards! I especially love the blue card. love your cards, the pinecones are just stunning. thanks for sharing your work. Beautiful! I especially love the blue one with the tree! The blue and silver combination is stunning. I love both cards! they have so much texture, but look like they would still be easy to mail. Very rich creations and so original. Thanks for a chance to win. Wonderful inspiration, thanks for the chance to win! Nothing says “holidays” like silver and gold, and your fabulous cards have both covered! I like both cards…interesting, unusual colors. Loving the cool blues for a different Christmas card! You’ve taken embossing to the next level, Svitlana! Twine-less is a very good thing … So SO beautiful! I was super excited to see your name on the blog hop…you never disappoint! Love the gold pine cones! So elegant! Lovely cards! Especially love the golden pine cone card. 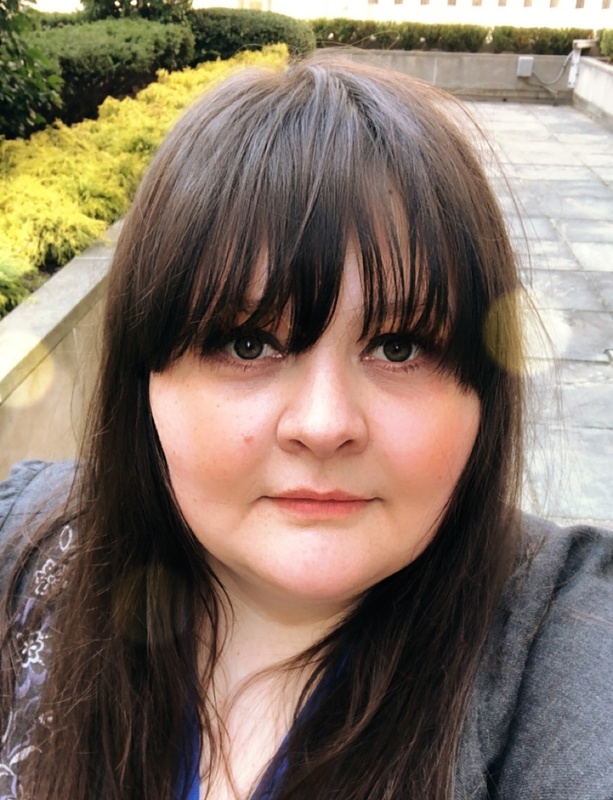 Altenew is my favourite stamp company – especially their stamp layering sets and I love what I’ve seen ladies do with PPP sequins and sparkles all over the internet. What a great chance to win amazing prizes! Both cards are gorgeous, I love how you work with texture. L really love the shade of blue on the blue tree. The first tree I had when I got married was trimmed all in blue ornaments. This tree reminded me of that. The pine cone card has such great texture. It looks like you could actually pick it up off the card. I love that blue color you got on the card! Wonderful cards! The second one is my favorite, but I do like how you used the dies on the first one to create a mask. I love the pinecone and branches card. Very creative. Both of these are so pretty! Thanks! very different but equally beautiful cards!! Gorgeous pinecones…I like the brass powder…exquisite! The garland is a surprise element and makes a lovely card. Thanks. Love your creative use of the twine die on the first, and your brown beauty is so stunning! Love it! 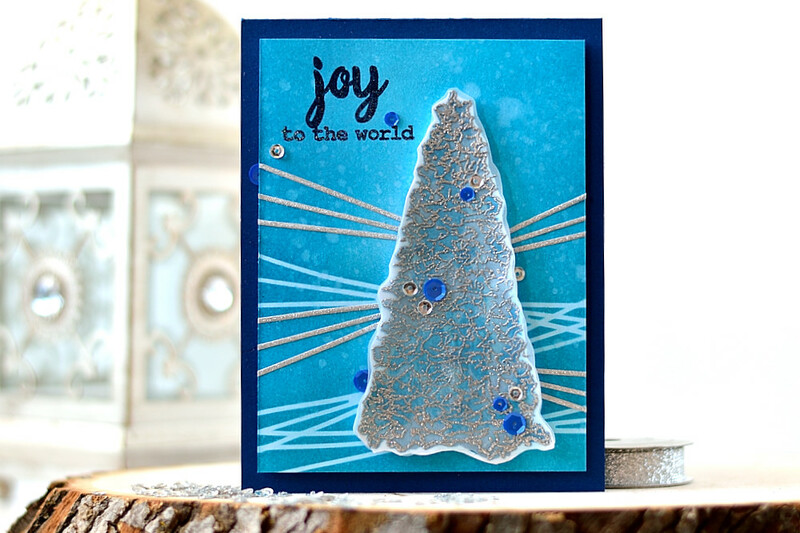 I love the vibrant blues and your background of the tree card, and the elegant gold embossing and layers of the pinecone card. Two very different yet equally beautiful cards. 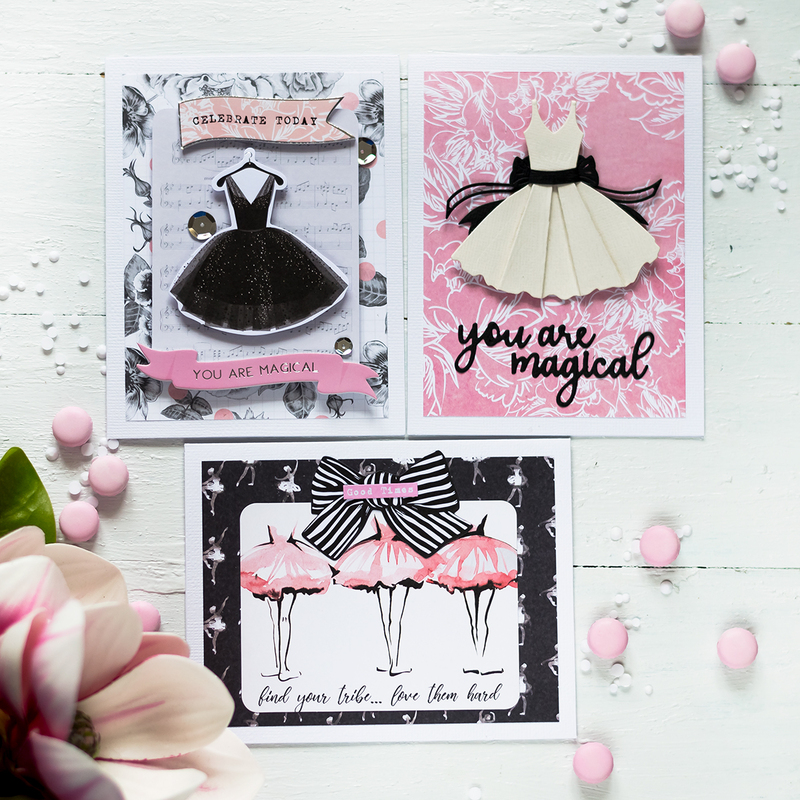 Gorgeous cards, simply stunning! I love the twine and bows masking technique for light “rays” and the silver embossed vellum layer of the tree is sooooo pretty! 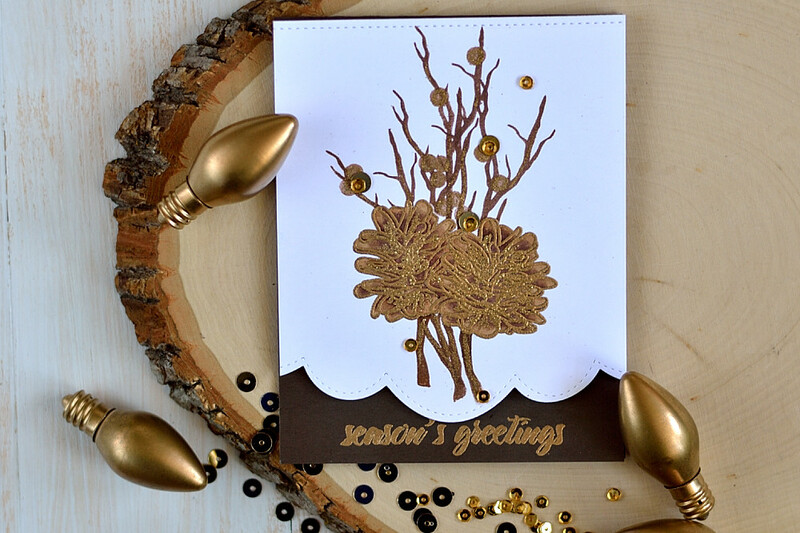 The pine cones and branches are so richly gold, love the brass embossing color! These are both so beautiful Svitlana!! I especially love the blue card!! The background is so pretty with the tree!! Your two cards are gorgeous, but I specially love the Christmas tree one. The blue (my favorite color) with the silver are perfect together. Truly unique cards! Love the blues in card # 1. 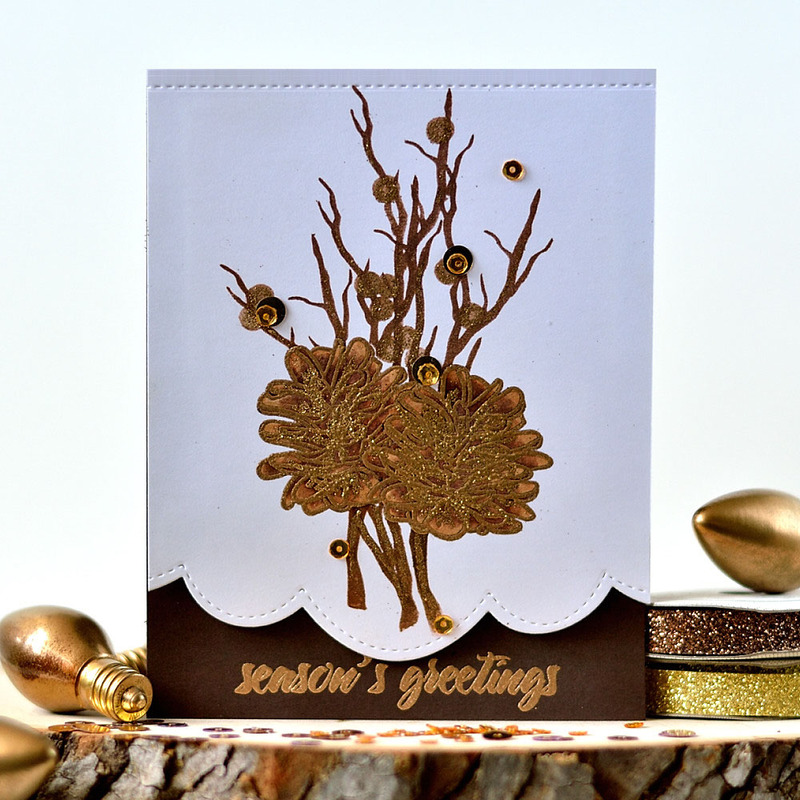 The bright gold pine cones are beautiful, too, in the second card. Thanks for sharing your designs! Thanks for sharing these cards in the hop! They really showcase products from both companies very well. Beautiful blues in the beacon Christmas tree. The browns and golds wonderful. Joyful Tree and the pinecones are fairly dancing! Beautiful cards. Love the blue tree. Love these cards. The silver tree is my favorite! So elegant with the silver and the gold. Beautiful Christmas tree! I love the blue hues! Svitlana, such a gorgeous card really love the gold on it! Great job, thank you for sharing. ???? Wow, your elegant cards are amazing. The tree card is lovely. It looks like the tree is glowing! Amazing designs. Love the gold, silver and vellum additions to your designs. Very pretty cards. Wonderful inspiration. Fab cards, thanks for the inspiration. Both cards is so lovely. What an great chance to win a fabulous gift. Thanks for sharing. Bold and wonderful, you really know how to make a stamp shine! Love all the shine you brought to your cards with the metallic heat embossing, sequins and the silver glitter paper. Very festive! Love this card, thanks for sharing! I always love blue Christmas cards. Lovely! Both your cards are exquisite. I love your vision and how you see multiple uses for products. The gold pinecones and branches are beautiful. Such pretty colors and themes! Beautiful cards. Love the brown and gold AND the silver and blue! I love so much your stunning cards!!! Such beautiful cards! I love the brass embossed pinecones, they look amazing. I think how you used the Pretty Pink Posh twine and bows die was so creative, that is such an awesome die. 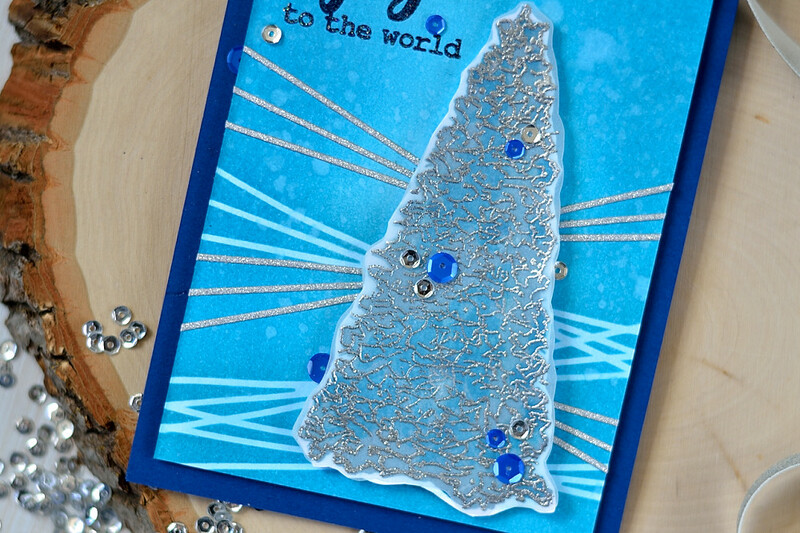 You Christmas trees is gorgeous, I love that you used a paper then velum for each of the stamp layers, it really turned out beautifully! Wow! My two favorite companies, PPP & Altenew, A Hop, a Coupon and a Giveaway! Yeah FRIDAY!!! Both are just lovely. Definitely not ‘run of the mill’! The blues are unexpected but really gorgeous, and the golden tones of the woodland elements are elegant. I would love to see a photo of the arrangement that inspired this one. Thank you. Such great cards! I love the silver tree and background! So creative! Thanks for sharing! Two beautifully done cards!! Love your use of the images and dies from these fabulous companies! The minute I opened your blog the gorgeous blue Christmas tree wow me. It is gorgeous and so festive. Your second card is stunning also. What pretty cards. I especially like the golden pinecones. 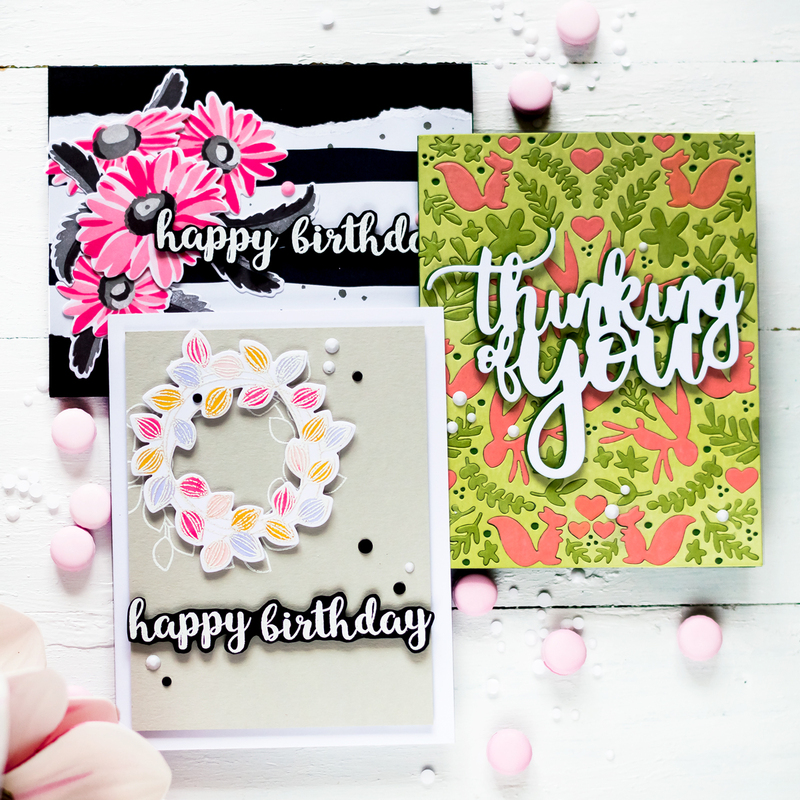 Such gorgeous tones used on your beautiful cards! Beautiful cards, love those pine cones! Stunning. I love the masking on the blue card. Very unique designs and colors!! Beautiful cards, love the blue one ???? Wow you’ve created such interesting texture on your cards with the embossing. Both cards are absolutely stunning! 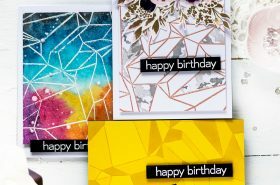 Great card designs! Your tree card is just so very gorgeous. Two really beautiful cards. Both are so unique and beautiful. Gorgeous cards! Love the tree and the beautiful colors you used, and the pinecones in the rich colors! Your tree is so pretty and I adore the pinecones. What a wonderful gift for the recipients! Very pretty cards! Thanks for sharing! Pretty cards~! That brass ep is AMAZING!! Both cards are fabulous! I love the blue colors on the first card! wow, your christmas tree card just blew me away!! I love the masked lines and the depth of shading you achieved. The embossed tree looks amazing! I love your gorgeous Christmas tree and the wonderful colors that you’ve used! Beautiful! So pretty! The lines on the tree card are like light rays shooting out! SOOO cool! Both cards are great! Wonderful Cards. 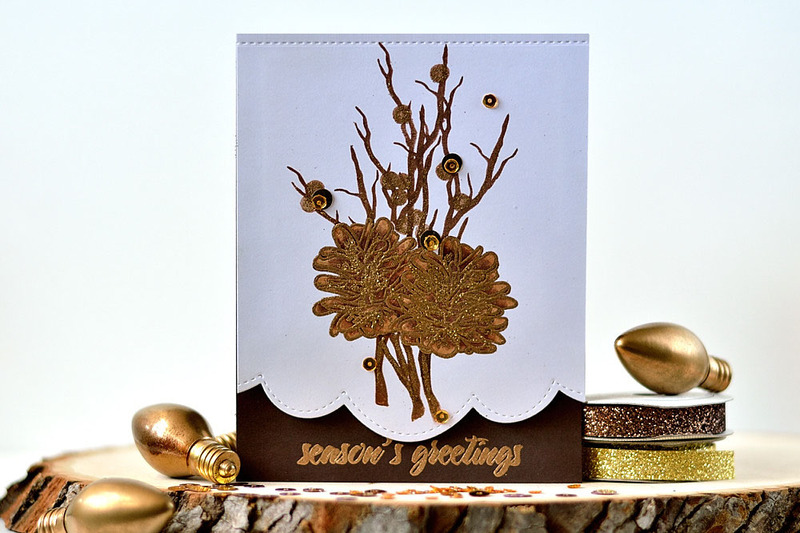 Thank you for the inspiration.Yor tree card is so happy and cheerful and the pinecone card is very elegant! Your cards are so beautiful!!! Very pretty. Love the blue colors. Gorgeous cards! The blue one is my favorite. I saw the blue tree card and just said WOW! It’s amazing. Love the pine cones too. Great use of different stamp sets. Your card designs are always unique and creative! Love both cards! Soooo pretty and elegant! Love all the embossing! Love those pinecones! Very creative way that you did these. Thanks for sharing! Great blog hop with two awesome companies! Great cards! The gold pine cones are so elegant, and I love the blue tree with PPP twine light rays! Two very different card, yet both are totally beautiful. The background on the first card is like nothing I’ve ever seen, while the embossed pine cones are amazing. Beautiful! Love the gold on that second card! Your cards are gorgeous. I love silver so the tree is my favorite. Great techniques on both cards. Thanks for sharing! Pretty and festive holiday cards! 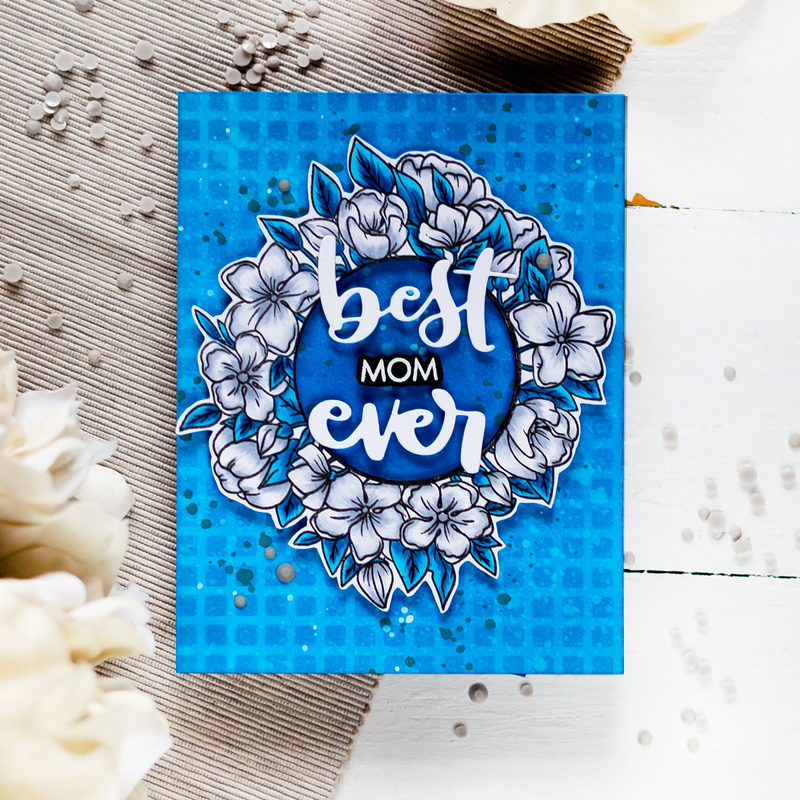 The embossing adds so much extra pizzazz to each card. So pretty, I especially love the blue one! I absolutely love both of these cards Svetlana! You never disappoint with your colour choices and techniques. Love this fabulous collaborative hop, enjoying seeing all of my favourite Altenew products teamed up with Pretty Pink Posh. Thanks for the inspiration and chance to win! Beautiful cards. Just love the pine cone and branches one. Thanks for sharing your talent. 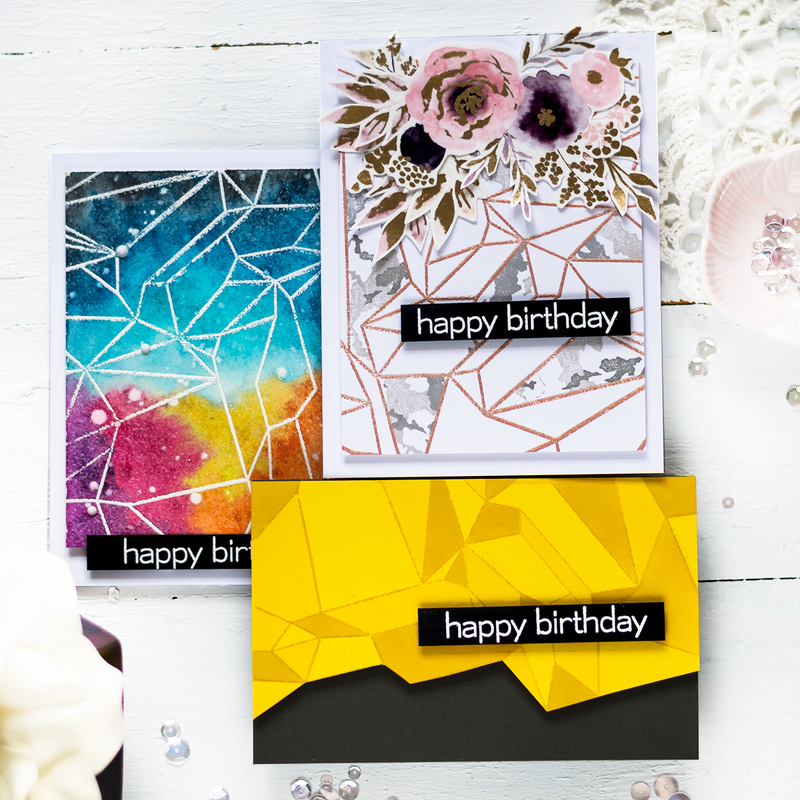 Wow your cards are really different – the designs definitely stand out! I love the golden pinecones – absolutely gorgeous! What stunning cards!! I love the last one with the gold. It is striking!! It doesn’t get any better than trees and pinecones! Beautiful cards! I really love how you highlighted the tree with those twine dies! Very beautiful and creative cards. I love the pinecones in brass, just fabulous. GORGEOUS cards! The silver overlay on the tree is so rich! These cards have such amazing little details! THANKS for sharing! Love the blue and gold, to. Such beautiful cards!! Love the metallic embossing!! The pine card is lovely! The silver tree is beautiful. That is a fantastic stamp. Great cards! Those golden pine cones are my absolute favorite!! I am a sucker for silver and blue! The tree is absolutely beautiful with the layering of vellum embossed with silver! 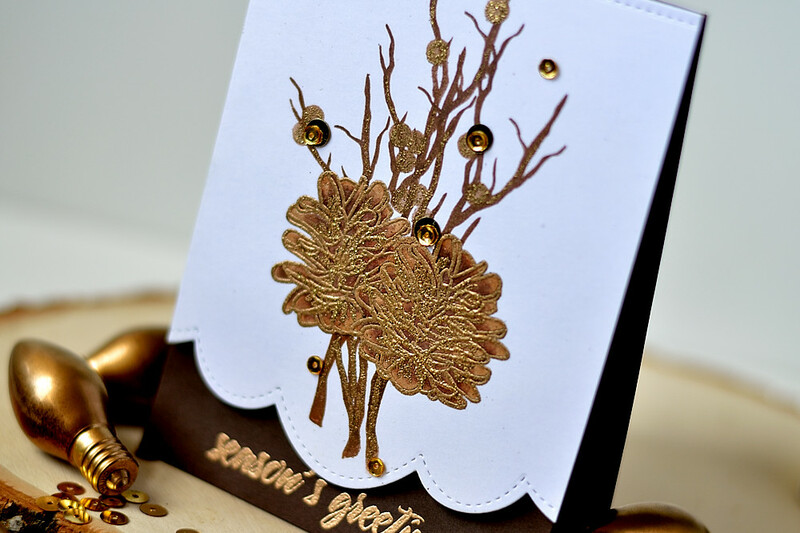 The stitched edge on the gold pine cones is a really beautiful touch to this card! My new favorite company. Great products. Gorgeous stamping Svetlana! Fabulous showcase. WOW! These are both absolutely gorgeous!! I couldn’t choose a favorite if my life depended on it! The gold pinecones are magnificent and I love the silver tree! Would love to receive either one of these lovely cards!! TFS! Oh, my goodness, the pinecone and branches – just LOVE this!! Thanks for sharing! Great card! Love the colors! Love this sentement . Your catd is pretty . Wow stunning! Especially love the card embossed in gold!! Beautiful cards! Love the embossing! Love the color scheme. Very pretty. Gorgeous cards!! Love the color and stamping! Love the bold, standout colors on both your cards. Great cards! Love the blue background and the stripes so pretty. And the gold with the sequins is so pretty! Love all the blue and gold! Both gorgeous cards! Love them! 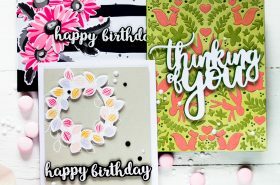 Pretty cards – love that scallop die.